Automix cartridge dispensed bis-acrylic temporary provisional material for crowns, bridges, inlays, and onlays. 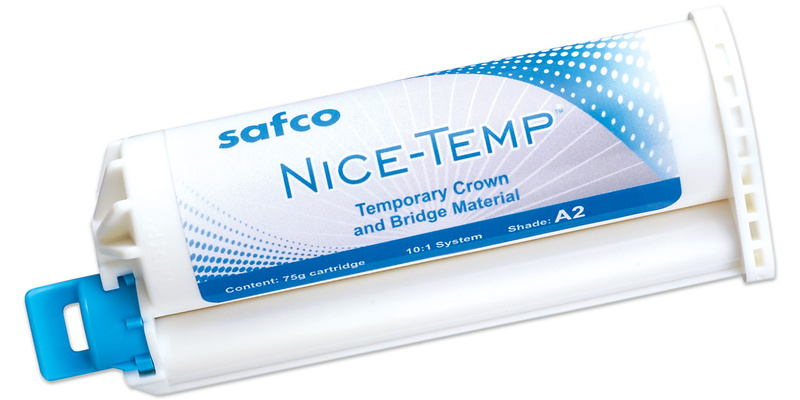 The high fracture toughness makes this the material of choice for longer bridge spans. Possesses a natural-looking fluorescence, and is easy to shape and polish. Methyl methacrylate-free for a low temperature increase during the setting phase. Dual cure. Uses DS 50 or DS 74 gun marked 4:1/10:1 (requires a 10:1 plunger, which the vast majority of DS 50 and DS 74 guns already have). Intraoral setting time 1' 00" - 2' 00"
Contains: 1 x 75g cartridge, 10 mixing tips. Mixing tips have blue hub, clear barrel and orange mixer.